So the costume designers made a compromise between authenticity and modern designs to appeal to the audience and give the impression of her changing status as her look evolved. The same goes for music in movies like Moulin Rouge and The Great Gatsby, these aren’t the original songs or even the original genre of music, but the point is to capture the excitement of the time and place and draw the audience into the world of the film. And the same goes for NBC’s Dracula. 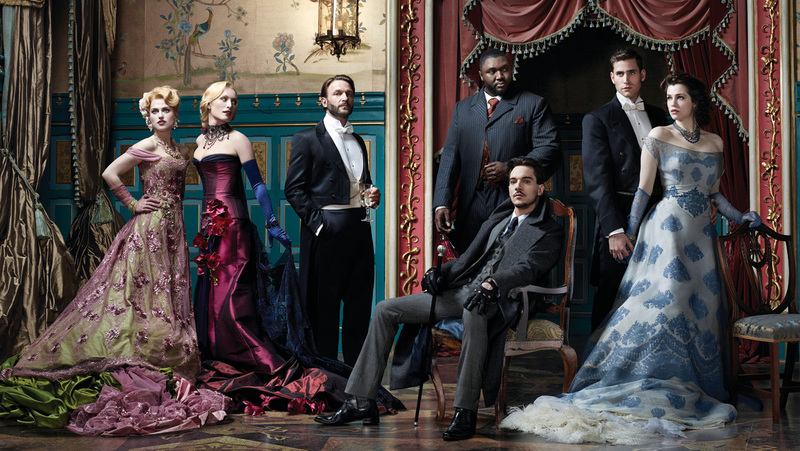 The men’s clothing is absolutely gorgeous and connotes the huge wealth that Dracula and the Order Draco control. Except for during the occasional ball, Mina’s clothes are much plainer than Lucy’s, which brings their different social statuses into focus. Here are some costumes and sets for you to drool over. This entry was posted on November 21, 2013 by Phoebe Darqueling. It was filed under Home Decor and Accessories, Movies and Television, Steampunk You Can Wear and was tagged with Costume, Dracula, Jonathan Rhys Meyers, NBC, steam punk, Steampunk, steampunk TV. Totally agree with your point about getting character across being as important as authenticity. We can never completely accurately recreate the past (especially when throwing in vampires) and getting audiences to feel the right way about the setting is just as important as informing them about how it looked. Totally agree about the character vs. authenticity issue. Having come from SCA, where often one will find individuals who are sticklers for authenticity, I love the freedom of steampunk to let your imagination show through.